Mobile application development already promises support for many types of devices and experiences, letting companies leverage on the convenience it brings to the table. At the same time, the field still has room to grow, which makes it all the more exciting to follow. We at Resco are dedicated to staying on top of market trends and bring only the best to our customers. 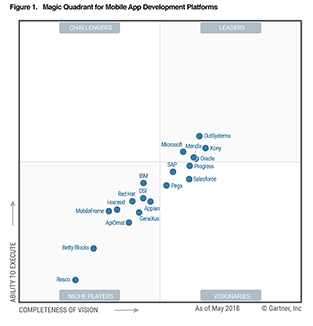 We believe our inclusion in this year’s Magic Quadrant is based on completeness of our vision and ability to execute it, alongside with our global and industry-wide reach. This graphic was published by Gartner, Inc. as part of a larger research document and should be evaluated in the context of the entire document. The Gartner document is available upon request from Resco. Gartner does not endorse any vendor, product or service depicted in its research publications, and does not advise technology users to select only those vendors with the highest ratings or other designations. Gartner research publications consist of the opinions of Gartner’s research organization and should not be construed as statements of fact. Gartner disclaims all warranties, expressed or implied, with respect to this research, including any warranties of merchability or fitness for a particular purpose.